o warning signs makes hypertension a deadly assassin. Can lowering high blood pressure naturally help you beat the silent killer? A busy and hectic lifestyle. If you are anything like the average Briton, chances are the above sounds very familiar to you - yet what so few realize, is just how dangerously close we are to breaking point. As a result of such daily stresses, more than 16 million people in the UK are thought to have high blood pressure - but perhaps more alarmingly - about five million of them are completely unaware of it. Some figures for you? High blood pressure is a major cause of heart disease and strokes in the UK which claim 200,000 lives every year. Moreover, it is estimated over 30% of us will die from some form of cardiovascular disease. Hypertension is often called the silent killer because, in most cases, there are no symptoms or warning signs (the only way to recognize a problem is to have your blood pressure checked regularly). What are the typical high blood pressure dangers? Undiagnosed, hypertension can damage the brain, sight and kidneys. High blood pressure is also a major factor in erectile dysfunction in men and can trigger life-threatening complications in pregnant women. A recent report from Lloydspharmacy which offers free checks at 1,500 of its chemist stores, suggests hypertension is becoming more common and starting earlier than official estimates suggest. Analysis of more than 8,500 tests carried out in the first six months of the year, found only one in four people had ideal or normal blood pressure. But perhaps most significantly, one third of those aged 16 to 34 had dangerously high blood pressure levels. So what measures can we take to combat high blood pressure without popping pills? Lowering high blood pressure naturally is easier than you might think. 1. Healthy high pressure numbers. 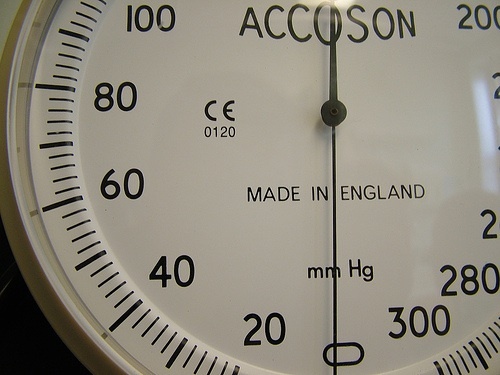 Ideal blood pressure levels should be about 120 over 80. The first number is the systolic reading which gives the pressure in the arteries when the heart contracts. The second number is the diastolic which shows the pressure between heartbeats when the arteries are relaxed. However, while anything between 120/80 and 140/90 is considered normal, these figures are not necessarily healthy. For example: if you have a reading of 135/85 you are within the normal range, but have twice the risk of heart attack or stroke of someone with a reading of 115/75. Lack of exercise, poor diet, obesity and alcohol all increase the risk of hypertension. 2. Exercise for high blood pressure. Strength training is the best form of exercise for rehabilitating an out of shape metabolism or an overweight body. Consistent strength training as proposed on this site, will set off metabolic changes that grow the muscles; strengthen the bones; signals the body to burn more fat; and increases your muscle's ability to draw oxygen from the blood - the benefit to you? Improved physical conditioning leading to optimal cardiopulmonary fitness in addition to strength (in short, strength training benefits your heart). In the same way all boats rise with the tide, your improved physical conditioning will aid your health. Build your strength, and you will automatically improve your cardiovascular fitness, your endurance, and your metabolic health - 3 key elements in lowering high blood pressure naturally. 3. Diet for high blood pressure. Lack of exercise, poor diet, obesity and alcohol all increase the risk of hypertension. This is why a balanced diet and healthy food for the heart not only fuels your workouts, but will lower high blood pressure naturally. Eat Beetroot. Researchers at Barts Hospital and the London School of Medicine and Dentistry found drinking 500ml of beetroot daily reduces blood pressure. Reduce Your Salt. An adult should have no more than 6g of salt a day but the average intake is 9g. Reduce your salt intake and reduce your risk. Go Veggie. The DASH study - Dietary Approaches to Stop Hypertension - proved plenty of fruit and vegetables lower blood pressure as effectively as medication, meaning you get to lower high blood pressure levels naturally. If you are over 15% body fat for a guy and 25% for a girl, now might be a good time to overhaul your diet. Substitute skim milk for whole milk; change virgin olive oil for all liquid oils; consume more raw foods; boost your fiber intake; eliminate all sugary carbohydrate and junk foods; eat generously of foods rich in essential fatty acids (e.g., oily fish like mackerel and salmon); add an anti-oxidant food supplement including vitamins A, C, and E; if you are a smoker, stop. Follow this prescription for the next few months, and you will see big improvements in your health and well-being. No warning signs makes hypertension a deadly assassin. Can lowering high blood pressure naturally help you beat the silent killer? Let your 3-step guide show you how.